WAY NICE!!! Made me smile! Great looking bike! The girl looks so happy to be out in the sun. Cute girl, very nice lifestyle photo more so then fashion, a bit of beach culture for the city folks to enjoy, lots of color. Great picture of the All-American girl. A picture of health and beauty. Love the bike. I love the laid back style. The old sweatshirt and swim bottoms. I need a day to wear a look like that! That old bike is fantastic too. So beachy cool! Gorgeous! Love the bikini bottoms with the bright bike. Such a happy-looking girl. That’s what I am talkin about. Sunny + happy + healthy. I don’t know if it was on purpose or accidental but all of the colors are perfect from the bike to the bracelet. I love the scene; the essence of a summer day with a darling model to boot. What a great bike! So stylish and the colour…! A lovely summer shot! Wouldn’t it be nice to have a gorgeous bike like that for beach riding? Hell, wouldn’t it be nice to be at the beach?! Great shot. She’s beautiful, so natural !! And love her bicycle with the flowers ! what a great look + a great bike! Beach babe! Nice repurposing of the iconic Robert Indiana artwork on her top. 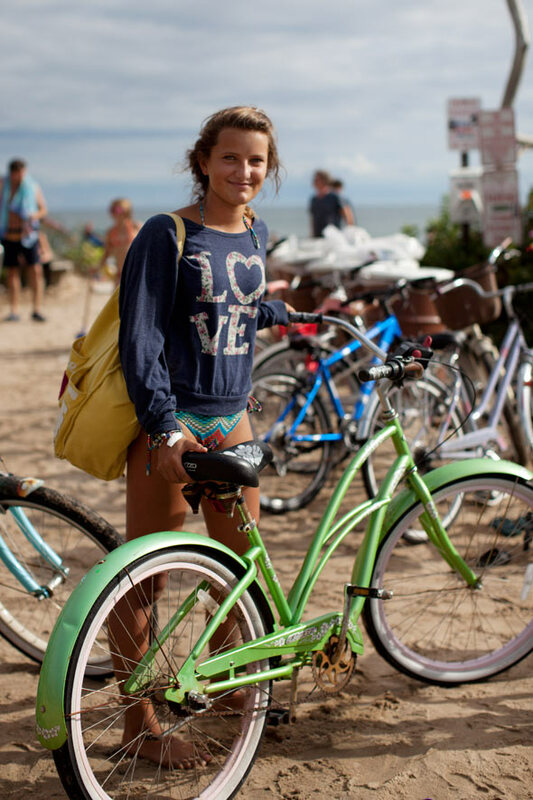 i love her sweater and her bike.. I’m really loving these beach photos! What a great photo. She looks so genuine, and I love her style and bike! Loved her style as well as the bike! I love her bike! This is really cute, I like the mix of patterns/colors here. so cute I LOVE the color of that bike!! In love with the bike aaaouw ! Oh how I wish you would come out to the California coast…. Her smile melted my heart. I am in search of her. hey, could she possibly be my guide for bike discovery tours of the peninsula? love the fun spirit of this photo. Beautiful young girl. Perfect shot. Love how all the simple colors in this photo stand out, like the green on her bike. Very beautiful young lady too, her eyes are gorgeous. LOVE that top!! So cute and perfect for summer! PERFECT summer picture! love is in the air :) love her bikini ! like that she looks so narutal, has a strong look. Simple and that makes her look so great! estupenda, se ve definitivamente estupenda. I don’t know you but I really hope people say thanks to you sometimes and comprehend the amount of hard work that goes into creating a well thought out site like yours – Thanks!! The bike is the star of this photo, lol. it was amazing blur effect. can you tell me the brightness, iso,and focus setting? what camera did you use?